3 || Eat. In case you missed my favorite Valentine date place in Dallas, see here. 4 || Do. This video really makes me want to learn how to shoot and edit video....how fun to be able to add pieces like this to one's blog. 5 || Interiors. You will love this apartment and do notice the chandelier in her closet. I guess we both have the same taste in DIYs. Have a fab weekend my love! I love that whole outfit above. 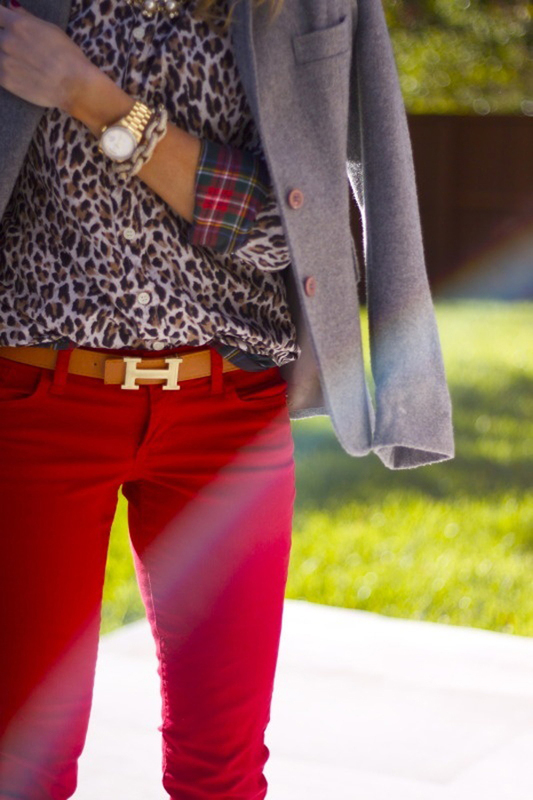 Leopard and red is always a winning combo! I'm entranced by Jane Mansfields home! I can't believe I've never seen it. Thanks for the link love! I wish I had an Hermes belt, but I have lots of leopard tops! have a great weekend! i'm sad i don't get monday off :( jayne mansfield's house is interesting ha. not sure about that carpet on the walls and ceiling of the bathroom! This pic is killing me! I need to step up my wardrobe! Have a lovely weekend Albertina and take care! I love that outfit. Have a great weekend. Holy wow! Love this outfit! Happy Weekend! Just found our blog and love the posts! Have an amazing weekend Albertina! Great image. I would never think to pair leopard and plaid together.